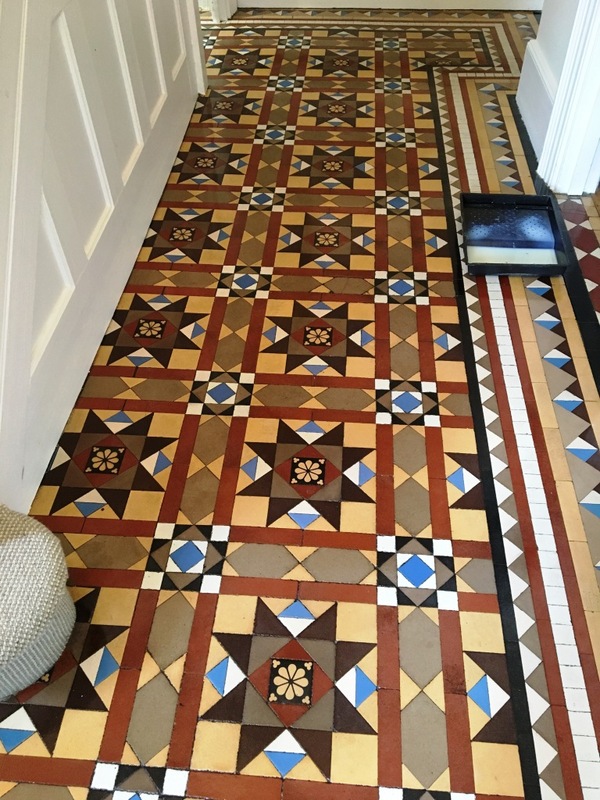 Apologies in advance but I forgot to take the usual before photograph of this Victorian tiled hallway in Twickenham that I worked on recently. It’s a shame really as it was certainly in need of a good clean and re-seal after years of inadequate maintenance and I’m sure a photo would have helped. 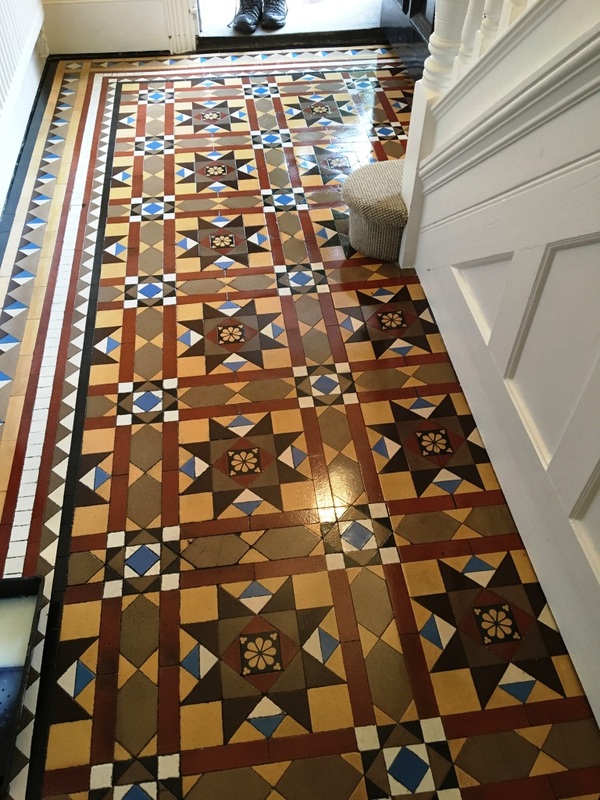 Victorian tiles are porous and do need a sealer to stop dirt becoming ingrained, as once that happens they can be difficult to clean and a Hallway is an especially high traffic area that will see a lot of dirt being tramped in. That activity also wears down the sealer over time so it’s important to keep it topped up. On these tiles, we used a 50:50 combination of Tile Doctor Pro-Clean mixed with Tile Doctor Remove and Go. This combination of products works very well to break down old sealers and also to clean the general soil away from the tile. As usual it was left to soak into the tiles for ten minutes before using a heavy duty scrubbing machine to scrub the floor clean. This achieved a good result and the soil and products were then flushed away using our special flushing tool which fires a jet of water onto the tile whilst vacuuming at the same time (no mess!) to an external tank. After allowing the tiles to dry off overnight with some heating on, the floor was ready to accept a new seal the next day. Our customer decided to have a sheen finish so we opted to apply Tile Doctor Seal and Go. These tiles are very porous and so need seven coats to be applied to the floor before it was completely sealed. Apologies again for not taking a before photo so you can compare the difference however hopefully you can see how health the floor looks following the deep cleaning and application of a fresh sealer which will ensure future maintenance is a lot easier for the customer. 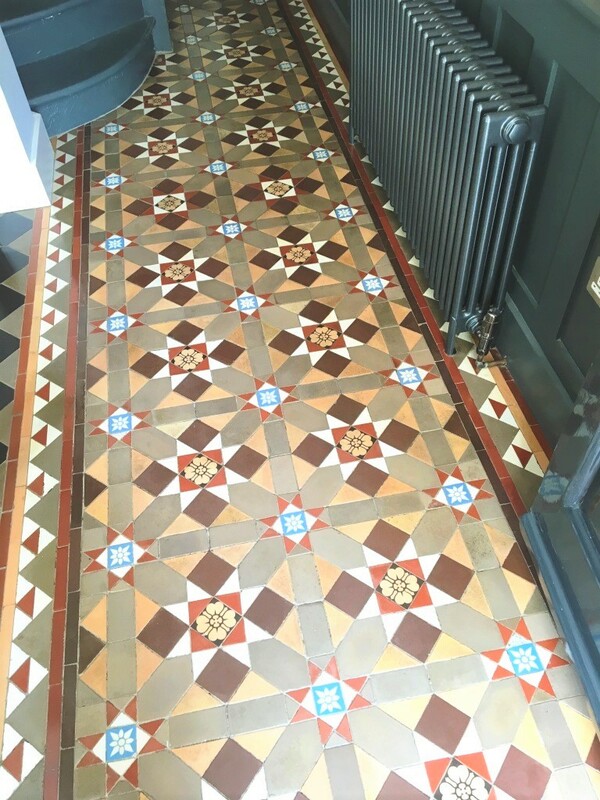 These photographs are of a Victorian tiled hallway at a house in Hampton, Middlesex which is South West suburb of London. 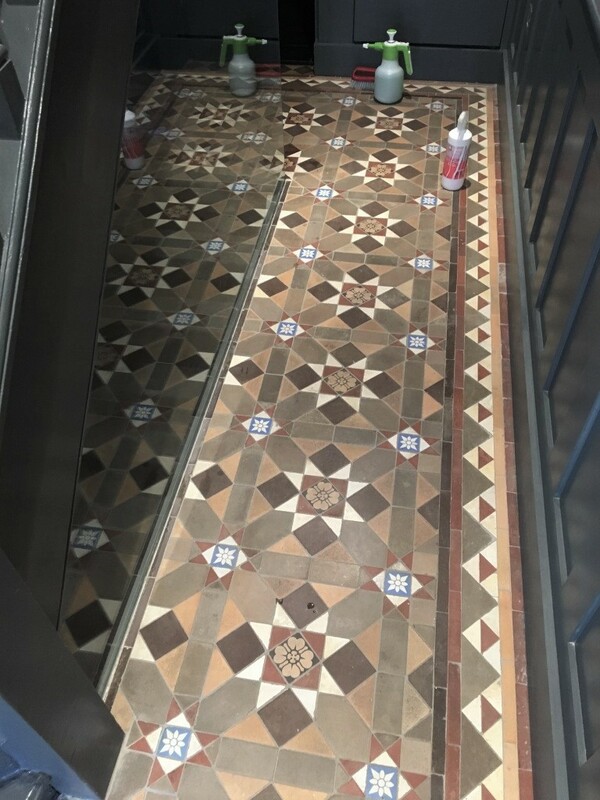 The tiles had suffered during the completion of extensive building works and as you can see from the picture below, the tiles were looking dull and had lost their vibrancy. On top of that the floor was heavily soiled with plaster dust as well as general soiling from wear and it had not been cleaned or sealed for nearly eight years. Victorian tiles are very hard wearing however and I knew I could put new life into the floor by giving them a good deep clean and re-seal. To get the tiles clean and remove unwanted coatings we applied a 50/50 combination of Tile Doctor Pro-Clean and Tile Doctor Remove and Go. This combination of products is effective at breaking down old sealers and coatings as well as cleaning the soil away from the tile. After allowing the tiles to dry overnight with some heating on, the floor was ready the next morning to accept a fresh sealer. Our customer wanted to have a sheen finish so we opted for Tile Doctor Seal and Go which works really well on Victorian tiles. Seven coats were applied to the floor before it was completely sealed and protected. As well as improving the appearance of the tiles new sealer will also make cleaning much easier for the customer.